Some of the most ferocious fighting took place around the Carter Cotton Gin during the Battle of Franklin. 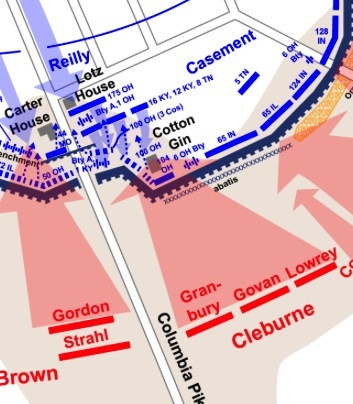 Confederate Generals John Adams and Patrick Cleburne both died in the vicinity of the gin. The Medal of Honor was awarded to Private John H. Ricksecker, Company E, 104th Ohio Volunteer Infantry for capturing the 16th Alabama Infantry Regiment’s battle flag near Carter’s Cotton Gin. This was in the vicinity of where many surviving members of the 16th Alabama had surrendered, probably along with members of the Mississippi 5th, 8th and 32nd Regiments and 3rd Battalion. Franklin story-teller Emeritus Thomas Cartwright talks about the action around the Cotton Gin. 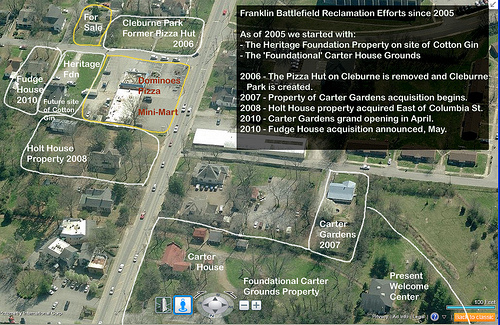 Plans are for the Carter Cotton Gin Interpretive Park to be constructed on the exact ground on which it originally stood in 1864, when the Battle of Franklin took place (30 November 1864). 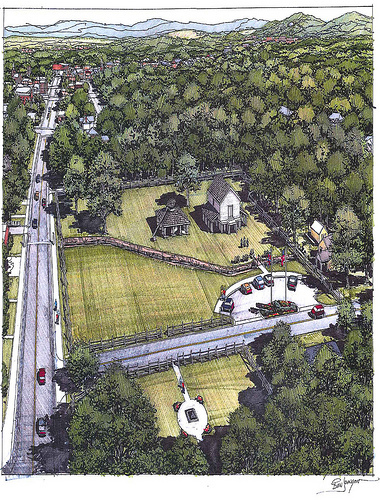 The park will include a replicated cotton gin based on the detailed designs by the Carter family, as well as a partial replication of the original Federal earthworks on the site. Historians like Eric Jacobson have long-tenuated that the fighting that took place between Confederates and Federal units on this exact land during the battle was some of the fiercest ever waged in the Civil War. Much of the fighting took place at night, in hand-to-hand combat, and the outcome was in doubt to the very last hours of the action. 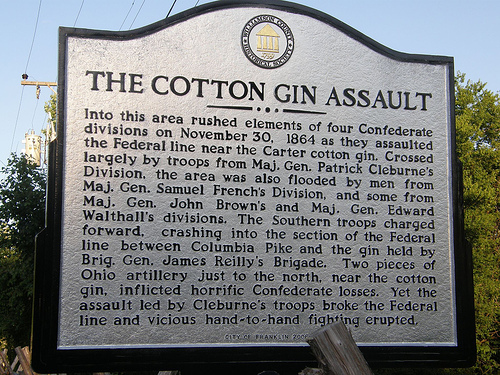 Confederate Generals Patrick Cleburne and John Adams fell mortally wounded within sight of the original cotton gin. There were nearly 10,000 total casualties within five hours at Franklin. “Must-Know” facts about the Carter Cotton Gin. William F. Gibson, 8th Arkansas Infantry, was severely wounded near the Cotton gin. He was saved by a Union soldier – and fellow Mason – and was carried to a nearby Franklin-resident’s house. He survived his ghastly wound. Bentley’s 104th Ohio Infantry account of action around Cotton gin. 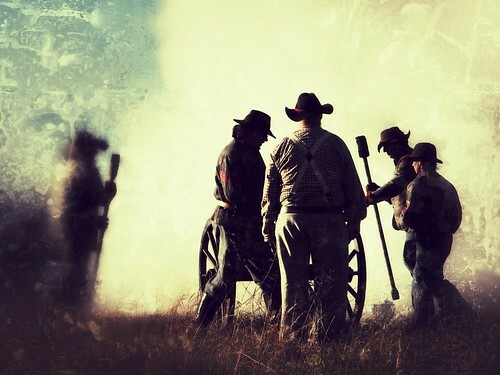 “The smoke had lifted but little when we could see rags upon bayonets from the ditch in front, and could hear them calling out, ‘For God’s sake, don’t shoot, and we’ll give up and come in.’ Of course, over a thousand were captured by our brigade, of whom two hundred survivors of the 16th Alabama, and as many more of the others commands, fell into the hands of the 104th (Ohio Volunteer Infantry), as well as eleven rebel battle flags. But it was not by any means a bloodless victory for us. The 104th had sixty killed and wounded, besides, perhaps a dozen of our skirmishers taken prisoners.